Excerpts from FIFTY YEARS OF GOAT KEEPING 1949-1999 published by NORWICH AND DISTRICT GOAT CLUB. This book was published in November 1999 - the Fiftieth Anniversary of the club. In the beginning was the Norfolk and Suffolk Goat Society. Not the beginning of time, you understand, but in 1919, before living memory for most present-day goat keepers. This society, as its name implies, tried to meet the needs of goat keepers who in early days were fairly thin on the ground but scattered over a wide area; inevitably there were numerous goat keepers who had no means of travelling the distance to all meetings. In the period after the second world war when there was an upsurge in goat keeping, a need was felt for more local clubs, and so it was that in 1949 a group of people got together to form the Norwich and District Goat Club. By the early fifties there were a number of local clubs - The Ipswich and District Goat Club, The Sudbury and District Goat Club, The Swaffham and District Goat Club, and The Colchester and District Goat Club. All these clubs were affiliated to the Norfolk and Suffolk Goat Society. Then, as now, some members belonged to their local club and also to the umbrella Norfolk and Suffolk Goat Society. The bi-monthly magazine "Gleanings" produced by the Norfolk and Suffolk Goat Society included reports from every local club. In the late fifties there was considerable discussion in the goat world about the desirability of the two counties club remaining in existence, which came to a head after the resignation of the chairman Mr A D F Dawson. In October 1959 an article was written by H E Jeffrey in the "Gleanings" to set out the committee's view. This was that, although the local clubs provide a better service in offering accessible meetings where problems could be discussed, practical demonstrations given, and know-how passed from experienced to novice goat keepers, it was felt that there was still a function for the Norfolk and Suffolk Goat Society. 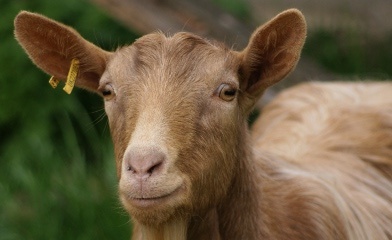 It was felt that there was a need for an "umbrella" organisation to avoid overlap or clashing of events, as a financial buffer, as an opportunity for representation of goat keepers throughout the two counties and - through the magazine - to provide a means of communication over a wider network. So it was that, give or take a small problem here or there, the Norfolk and Suffolk Goat Society and the Norwich and District Goat Club have coexisted happily to the present day. My first club meeting was in 1967. We entered the close through St Ethelbert's gate, where the peak-capped Custodian of the close waved us through after receiving the password "goat club". On arriving at Pull's Ferry we ascended the narrow stairway and entered the clubroom over the arch, where we were warmly welcomed by the chairman, Mr Gunning, and introduced to the members present. The atmosphere was more of a social gathering than a business meeting - debate being enlivened by Miss Loveridge and Mrs Galloway - with an interval for tea (goat's milk of course!) and cakes. The advent of the riverside walk reduced the number of parking spaces at Pull's Ferry. This, coupled with the fact that club meetings very often coincided with Norwich City's home games, caused parking difficulties and on 7th December 1974 the venue was changed to Oddfellows Hall, Cawston. Here again there were parking difficulties and after about three meetings we moved along the road to Cawston Village Institute, where we stayed for several years. About this time the membership boomed, along with national interest in self-sufficiency, and during the summer months several members hosted open days and shared their goat keeping expertise with the masses. Two of these meetings I remember - a cheese-making demonstration by Mrs Crawley at Hunworth and a visit to Mr Holt at Antingham, where we learned about crops for goats (how I coveted his little tractor!). Novices and experts alike could learn from each other things like hoof-trimming and making goat equipment from odds and ends - I was inspired to make an outdoor goat-proof hay rack from an old bedspring and angle irons. At a later date, when building work was being undertaken at Cawston, members report meetings at Coltishall Village Hall and at Happisburgh. By the early nineties meetings were often held at the Horse and Groom Public House in Tunstead. Many meetings were also held at Bawburgh Village Hall, which is geographically convenient for most members. Inevitably,with more women in full time work, with the increase in the pace of life generally and with the plethora of other things to do, attendance at club meetings dwindled in the early nineties. It reached the stage where it was often not possible, even with raffles, bring and buy stalls etc. to cover the cost of the hire of the hall. The committee therefore decided to reduce the number of meetings and to have gatherings where possible of a more informal nature in members' homes. So Diane Parker's Christmas Social in December and a Family Saturday Lunch in January at the home of Linda Gibbons have been enjoyed and well attended and will probably remain the pattern for the next few years. We will still need to hire public halls for some functions - our Go-goat 1999 for example. This was the clubs public event for the fiftieth anniversary - many stands, goats of all sorts to see, a children's colouring competition, demonstrations and talks, pygmy goats and harness goats, freshly cooked goatburgers to sample and wonderful weather all combined to make a very successful day. The format may be altered to meet changing needs but the club meeting will certainly survive in some form or other according to the wishes of the goat keepers it serves.